Well, here it is. The Big One. My first marathon. I had been training for Kiawah for a while, but having two jobs can get in the way. After all, it’s not easy to devote four hours to a long run when you have work at a Starbucks all night. If you go farther than you ever have before in your life, then believe me… you’ll want a nap. Still, somehow I managed to get it done. I had planned for a modest first attempt anyway. 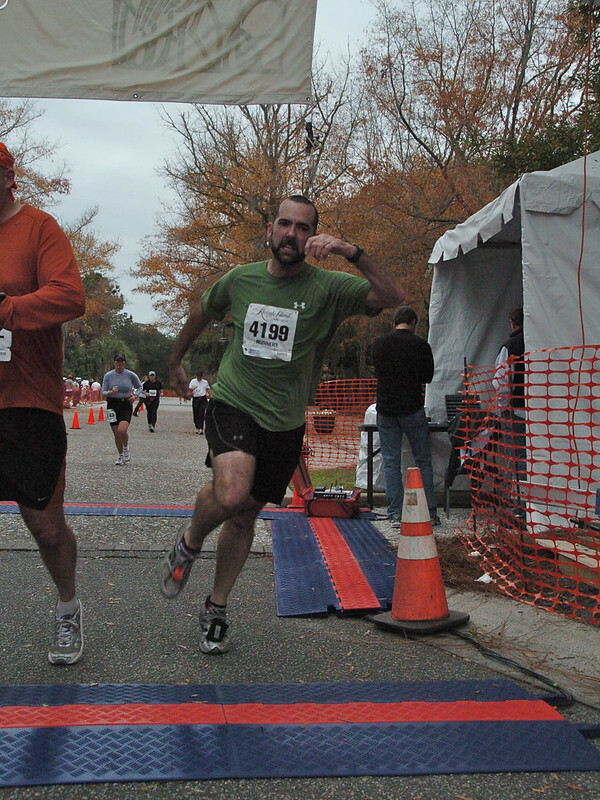 The Kiawah Island Marathon is a both a half and a full event. It’s a 13.1 mile loop. Some people do it once, some do it twice. In the photos below, anyone with a number over 4000 was running the full marathon. It has a reputation as a flat, fast course, but of course I have no personal frame of reference for that. All I know is there there are no scary nicknames involved. There’s not “Heartbreak Hill” or “Death to Brian Cribb Alley” or anything like that. There were water stations every mile or so, and port-a-johns every once in a while. This year people were encouraged to bring and refill water bottles rather than use paper cups. I normally run with a water bottle, but this time I wanted to go hands-free. I felt a little guilty wasting the cups, though. Next time I’ll probably take my bottle. Joanie came into my Starbucks and we talked about Kiawah just a little bit. We couldn’t go into details, though, because the store was kind of busy. That night she sent an email explaining that she and some friends had rented a condo which is literally a five-minute walk from the Starting Line. For $20 I could have a place on the floor if I were interested. Of course I jumped at the chance, just like the woman in the photo. When I went for my race packet, I went to the condo rather than going home. I met some really nice people there, many of whom were new to me. I wish I had their names all figured out, but unfortunately that’s not one of my strong points. It was wonderful, though. Everyone was older and more experienced at running than I am. I learned a lot. Rule Number One, for instance, is pretty simple. Always watch the weather channel. Rule Number Two: everyone is an early riser. We all got up at around 6:30am. A normal morning is much earlier, but we were so close to the Starting Line that we could afford to be a little lazy. Our checkout was at 11am, so we cleared out the condo and stashed our overnight bags in our respective cars, taking only small items with us to the race. I couldn’t believe it. We crossed a little street, walked past a few trees and we were there. It took maybe seven minutes. As you can see below, we were separated by our expected pace If you were planning to run a six-minute mile, then you could hang out with this attractive redhead. There were no groups past nine-minute miles, so I stayed in that group just ahead of the walkers. It was kind of cold, maybe in the 40’s, but not cold enough to wear any gear. If you stand around without a jacket, you’re cold. If you run with a jacket, however, then you’re hot. Fortunately there was an Article Tent where you could toss a bag until after the race. I wore my jacket and took some photos, packing it all away just before the start of the race. Above you’ll see Donna Brown and myself in front of the Article Storage Tent. I know I keep saying this, but she’s 72 years old and she still does this stuff. 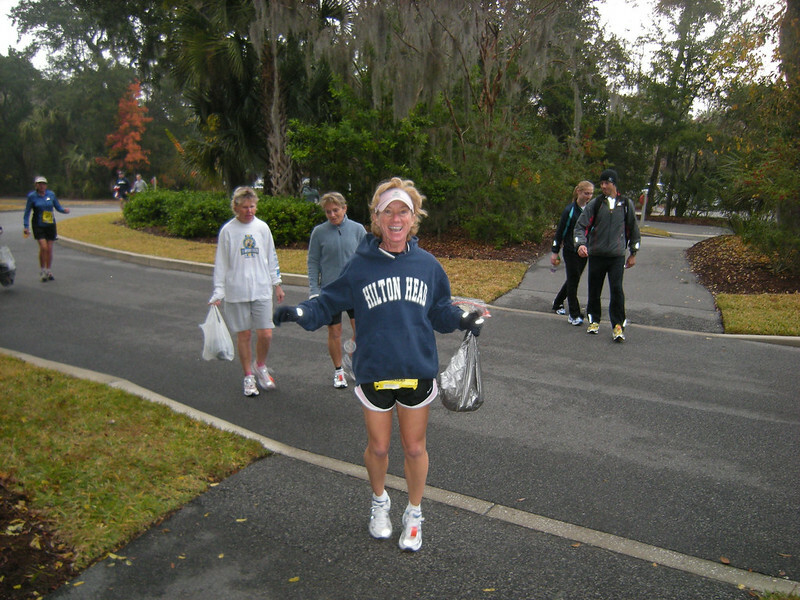 This time she was doing the half-marathon, but over the years she’s done it all. This is the Future, and it looks grand. 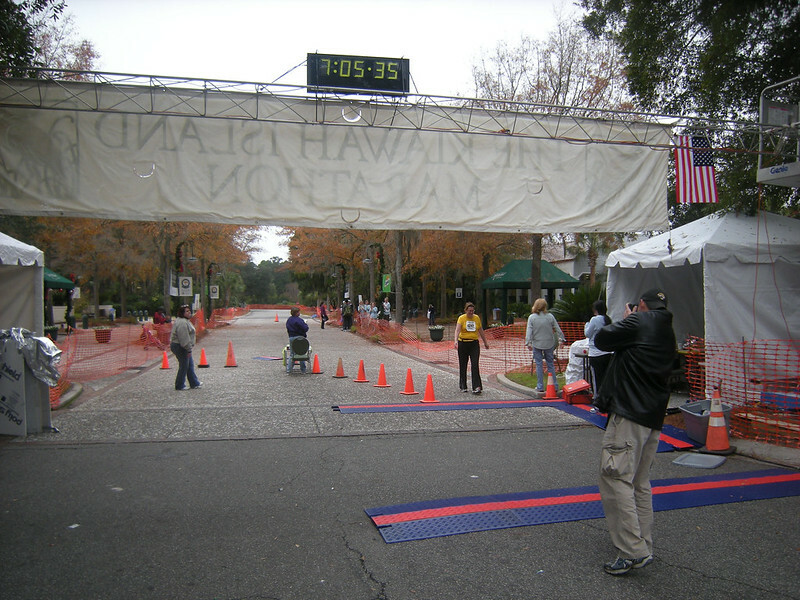 Note: any photographs in this article which don’t have my copyright border were taken by the folks at marathonfoto.com. I bought a cd with all of my photos on it, and they were nice enough to throw in some highlight photos. Those extras were sent at a lower resolution than the ones I paid fifty bucks for, of course. My primary concern was speed. I run too fast. I’m not talking about sprinting. It’s a pacing problem. I go just a little to fast now, and I pay for it two hours later. Since I had never run a marathon before, there was no way for me to truly understand the distance and it was impossible for me to pace properly. With that in mind, I resolved to walk every once in a while. It would force me to rest and to slow down. It was especially important during the first loop, where I had the most energy and would most likely screw up. It wasn’t hard to make friends. Running attracts good people. For a while I ran alonside a man named Raju. He’s retired Air Force, now working in I.T. for the Charlotte, NC Fire Department. I was with him from the start, and stuck with him for a few miles. He was certainly fun to run with, but he was going just a little too fast for me. If I kept up with him, I would most certainly burn out. Eventually I had to use a port-a-john anyway, so we split up. I stuck with Misty for the rest of the first loop. We had plenty of time to talk, but she hadn’t trained much lately and lost her wind near the tenth mile. She had to focus on finishing, so we ran in silence for a while. I used her pace to slow mine down, hoping that I could save some for the next loop. As we neared the turning point, she gave me some good advice about marathons in general and wished me luck. She finished her half in 2:25:58, which is pretty good for a person who claims to be out of shape. The second loop started out just fine, of course, but I could definitely see why people don’t like to do them. I knew the course at this point, and I understood how much farther I had to go. That’s a big deal, and it cuts into your will. Another thing to think about is the drop in population. 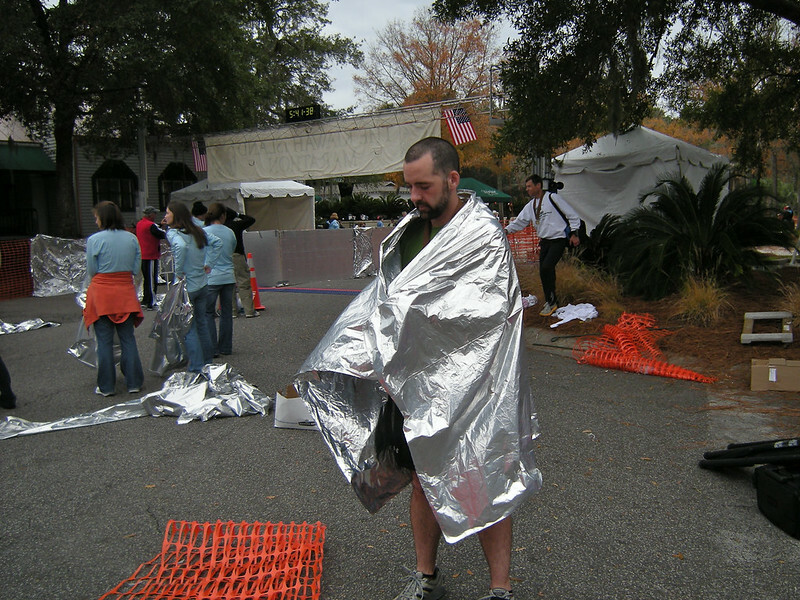 All the half-marathoners were gone at that point. I fell into step with a 72-year- old woman named Ekay. (It’s a nickname, I don’t know how to spell it.) She was a machine. She went to slowly for me to stay with her, but she never stopped. Seriously, she never stopped. She’s had decades to figure out how fast she ought to go, so she sticks to one speed. When asked about it, she said “I’m afraid if I stop, that I won’t start up again.” (For the record, she was adorable.) I left her behind after a minute or so, still trying to find my own proper pace. 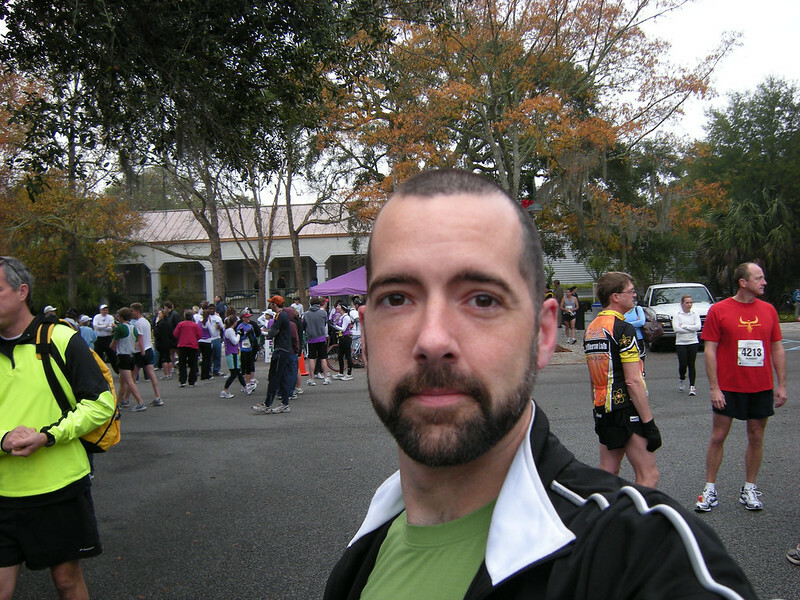 I was fine for a while, but after Mile 14 things were becoming more difficult for me. I could feel the exertion a bit more. My hamstrings were growing tighter, and I had to stop once in a while to stretch them out. I also had to slow down to a brisk walk a few times, just from fatigue. Ekay and I established a pattern of passing each other in tortoise/hare fashion, my bursts of energy contrasting her constant, steady pace. Somewhere after my pioneer mark of 18.5 miles, I found myself running beside an attractive woman with a t-shirt labeled “Run Naked.” I wanted to make jokes about it, but I was too tired. I just asked about it. Her name is Amy, she’s from San Diego, and the shirt is from a friend’s clothing line. 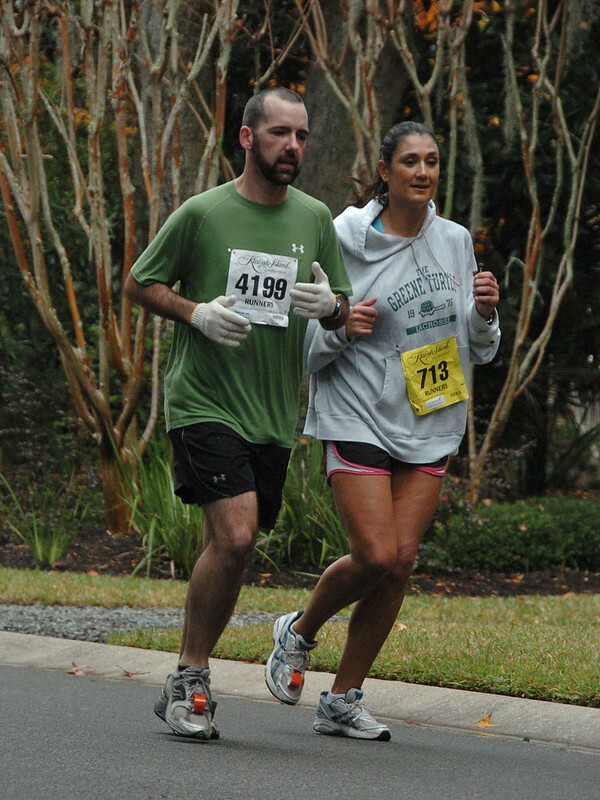 She’s a blogger who has run several marathons, so I was happy to join her for a while. You can read her review of the marathon here. I let her go just before Mile 22, but caught up when she stopped to greet her husband and friends on the sidelines. It was very hard for me to move. My wind is excellent, but my legs were burning. My hamstrings seemed to be ratcheting inward, shortening, pulling my legs back. I began to feel slightly detached from what I was seeing. As we approached a turn I noticed one of the SUV’s that were parked along the course and playing its stereo for everyone. People did that at several points, sometimes just in front of their own houses. I didn’t notice the details of the song, but I heard Amy call out “Grandaddy!” That’s the name of the band, apparently, and “On yer merry way” is one of her favorites. At Mile 24, I just couldn’t run anymore. I had to walk a bit. I told Amy that I was going to slow down, and she wished me luck. “If I see you in the next two miles then great, otherwise I’ll just see you at the Finish.” I stopped and stretched out my legs, watching Ekay pass me once again. I walked a bit. I ran a bit. I walked some more. It was really difficult. If I kept running then I burned, but if I walked then my body grew cooler and I could feel the cold sweat everywhere. I became acutely aware of the places where I was chaffed. The world droned on in a peculiar pattern. The road was endless again, and I was alone. I walked along trail through a wooded area, and found an unmanned water station. After I drank a bit of Gatoraide someone came out of the trees. She had a medical vest on. I suppose she was walking back and forth between parts of the loop checking on the runners. She looked at me critically for a moment, but dismissed me as I downed a second cup and backed away from the table. I must have looked pretty bad. I put the cups in a trash can and continued. After what seemed like an eternity, I saw the 25-mile sign. I thought about it as I approached. Would I start running at the sign? Should I start now? Should I just walk? It’s my first marathon, so it’s not like I was trying to win or anything. It’s the kind of debate that you have with yourself when your alarm clock goes off in the morning. As I reached the sign, I came to a decision. It’s just 1.2 miles. That should be nothing to me. It’s not that far, and I want to finish strong. I started running. Not just jogging, mind you, but running. I was going slightly faster than I do when I’m training, pumping my arms, bouncing on my feet. After a minute or so I sailed past Ekay. She said something encouraging (and most likely adorable) but I couldn’t understand the details. Shortly after that I flew past Amy. She also said something positive, but once again I couldn’t make out the words. My eyes were focused forward, the edges of my vision fading from my attention. All that mattered was the pace. All I knew was the moment. But nothing lasts forever. I slowed down to a ten-minute mile after a while. That’s usually my resting speed, but it was all I could manage after all of this exertion. 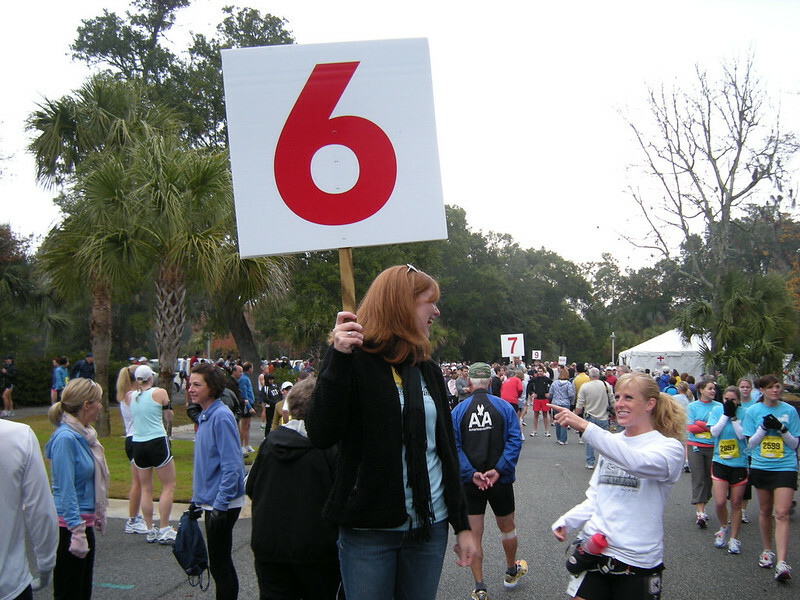 I saw the 26-mile mark and my heart leapt. I was almost there. Two tenths to go! I passed the 13-mile mark, placed there for the half. With Just one tenth of a mile left, I picked up the pace a little. I was in another pattern, bursting forward and retreating to the 10-minute mile pace again. Hearing him drove me faster, pushed me harder. The crowd’s cheering raised sharply as I poured on the speed, giving me even more power to push myself onward. I wove around a few people as I approached the line. they seemed stationary to me, unmoving. I passed them easily. When I reached the line I was airborne, having launched myself through. I know that it was all in my head, but there was a power in that short space. It was like passing under a bridge during a rain storm. Everything was pounding and pushing, and then suddenly it was over. I sputtered to a halt. I bounced on my feet like an aircraft making a landing, and it was a moment before I could take in my surroundings. There were three young women there to greet me. One had a silver blanket, so I focused on her. I was still stumbling a bit, trying to get my balance, unsure of where to put my weight. One of them asked if I was okay. I grunted an affirmative in response before finally stabilizing. My favorite greeter placed the much-needed blanket over me as the others approached. One held out a medal on a ribbon. I stared at her for a moment, and then lowered my head to let her place it on me. I guessed that the last one wanted my race number. I began to tear off the bottom tab, but she simply knelt down to remove the orange racing chip from my shoe with a pair of scissors. It was over. It was done. I had pushed through. I felt as though I had joined a sort of club. I was part of an elite group which was known not for race times, but for dedication and commitment. It was a nice feeling to focus upon as my mind returned to normal. I looked around without really seeing anything. Slowly, the details came to me. I widened my attention to a normal setting, and focused upon my next goal: the Article Storage Tent. I could only hold one thought at a time, and I was thinking about my jacket. After I retrieved my things I started bumping into various people that I knew, including my buddies from the condo. Everyone was happy. Everyone was congratulating each other. One of them was nice enough to take a photo for me. The one I actually posed for is at the very beginning of this page. The photo below was taken by accident, before I was ready. I think it’s a better photo. It seems more honest. I saw Amy again, met her husband and friends. I told them what I could about Charleston, but I’m a poor tour guide. We exchanged information and said some pleasant goodbyes. I had made a few more friends. Score one for the Running Community. It didn’t take me long to think about food, so when Joanie pointed me at the Awards Ceremony I was all for it. I ate, watched the awards as they were handed out and even sat with Ekay for a while. Eventually it was over, and Joanie came through for me yet again. There was a room nearby with massage students working for free on the full-marathon participants. Hell, yeah. I got on the list and waited for my turn. I credit much of my recovery to the massage. My legs were much better after she was done. Eventually I had to go home. I left the building and headed out for the condo. All my stuff was in the car, so I could just get in and drive. All around me, things were being taken down and disassembled. I walked past the Finish Line, but stopped when something strange happened. People started cheering. That’s right, the picture below is no joke. This woman finished at 7:05:35. I had to take a picture. I watched her cross and receive her medal, sharing in the moment of her victory as others had shared in mine. I wish I could properly explain the wide range of emotions involved to those of you who have never done this, but I just don’t think I have the words. Instead, I’ll just say that it was completely badass.